Why do so many change initiatives continue to fail miserably? 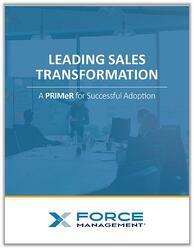 Even more importantly, what can sales organizations do to shift the odds in their favor? It’s important to understand that to obtain a lasting sales transformation it needs to come in the form of a process, not an event. DOWNLOAD OUR WHITE PAPER NOW BY FILLING OUT THE FORM ON THE RIGHT!